For most of us, the worst natural nuisances waiting at the local park are bugs and pigeons. But if you happen to visit Bangkok's Lumpini Park, troublesome birds would seem trivial in comparison to the ubiquitous giant lizards. Locals refer to these big reptiles as hia (which is apparently an extremely inappropriate Thai word you might use for someone or something you really don't like). The lizards can grow over two metres long and an estimated 400 of them call Lumpini home. Park officials have finally gotten enough complaints about them to decide it's time for these lizards to go. To use their more common – and less insulting – name, these are Asian water monitors. They are the second-largest lizard species in the world (after Komodo dragons) and are widespread throughout the southern portion of the Asian continent and nearby Indonesian islands. 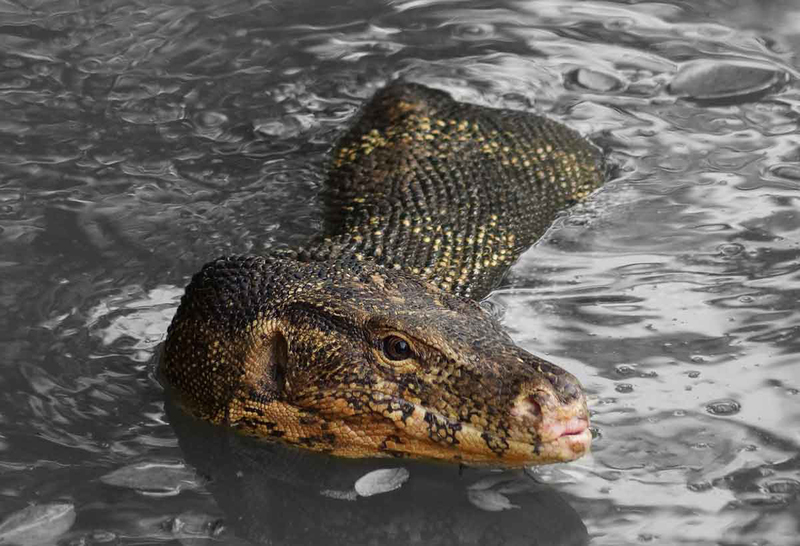 Despite their size and intimidating scaly smile, they aren't dangerous to humans. When it comes to food, they much prefer small animals like fish and turtles. They may not be dangerous, but they are a pain for many park-goers. According to a report by the Bangkok Post, “[W]hile they don’t hurt people, they have scared a few, and some cyclists have taken a tumble after running into one." Earlier this year, one local family got a big surprise as one of the monitors tried to invite itself into their home. 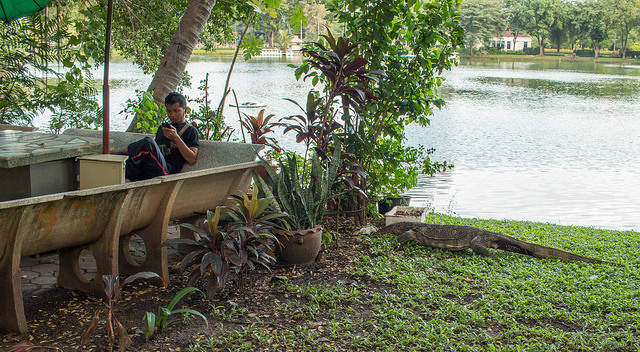 On Tuesday, officials from the Bangkok Metropolitan Administration began their mission to evict the park's reptilian residents. Armed with makeshift fishing poles, ropes and burlap bags, their plan is to round up the monitors and send them to the Khaoson Wildlife Breeding Center in the not-too-distant Ratchaburi Province. According to the Bangkok Post, officials aim to catch 40 animals a day, but that's no easy job. Video footage shows park visitors looking on as officials use catfish to lure the monitors out of the water, before grabbing and (rather unceremoniously) tying them up in preparation for the trip to their new home, where they will hopefully scare fewer people and get hit by fewer cyclists. Not surprisingly, the two-metre reptiles seem in no mood to move, with many escaping into the park's ponds. And not everyone has a problem with the lizards. "The hia do not hurt anyone," said Nipon Boonyapattharo, vice president of We Love Lumpini Park Foundation "They are friends with staff at the Lumpini Park." According to park worker Tawee Somnamee, the big reptiles are also part of local superstition. "If a hia goes into someone's room, they will become rich,” he said. Somnamee added that while the plan is to remove most of the monitors, some will be allowed to stay in the park. "There should be some left for foreigners to see," he said. While the lizards are a problem for people in the park, elsewhere in Asia the situation is quite reversed. Water monitors have long been hunted for their meat and skin, and like so many animals, they face the serious threat of habitat loss. No wonder they're so eager to hang out in peaceful parklands. An insect inside a lizard inside a snake, all three buried and preserved together. A monitor lizard may seem like unchallenging prey for a leopard, but these reptiles are well-equipped to put up a fight. Knock knock? Who's there? Massive monitor lizard that might be trying to eat your dog.